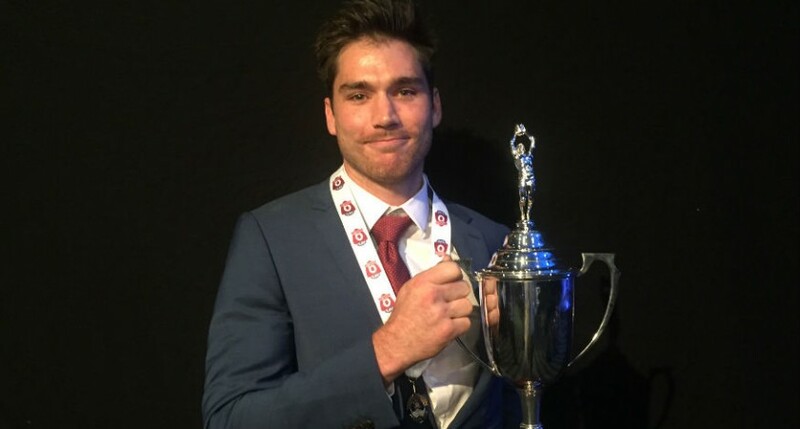 Palm Beach Currumbin’s Jesse Derrick claimed the 2016 Grogan Medal, the QAFL’s highest individual footballing honour on Sunday night. Derrick, the Lions’ captain, finished the home and away season on 21 votes, one ahead of teammate Josh Woolley on 20. Surfers Paradise’s Daniel Green finished third with 18 votes, two ahead of teammate Cassidy Haberfield and Sandgate’s Thomas Overington who polled 16. Derrick, who has played 100 senior games for both Palm Beach Currumbin and Broadbeach, hasn’t missed a beat in 2016. He has played a starring role in the Lions’ midfield this year, but has also been versatile enough to play a lock down role down back, as well as impact the scoreboard in the forward half. He started the year in perfect fashion, polling three votes in the first round, before storming home with three best-on-grounds in a possible four games, between rounds 14 and 17. Coming into the final round, he and teammate Josh Woolley were tied on 20 votes. Derrick polled one in their loss to Labrador, while Woolley missed out on votes. Derrick’s qualities were not missed by the coaches either, nominated for the Syd Guildford award, which was taken out by Labrador’s Wayde Mills. As well as finishing equal forth in the Grogan Medal, Cassidy Haberfield also claimed the QAFL Rising Star after an electric 2016 in the Demons’ midfield. Surfers Paradise’s Daniel Green took out the Ray Hughson Medal, as the QAFL’s leading goal kicker, with 83 goals. Palm Beach Currumbin and Labrador shared the leading number of representatives in QAFL team of the year, with five each. Jackson Emblem, Jesse Derrick, Josh Woolley, Jarryd Douglas and Jonathan Croad were all selected for Palm Beach Currumbin, while Labrador had Adam Clarke, Wayde Mills, Bill Hicks, Bryce Retzlaff, and Josh Baxter in the side. Fraser Pope, Daniel Green and Noa Corbett flew the flag for Surfers Paradise. Three clubs had two representatives each, with Morningside’s Nathan Kinch and Peter Mollison, Mt Gravatt’s Andrew Smith and Michael Hamill, and the Western Magpies’ Luke Scott and reigning Grogan Medallist, Callum Carseldine selected. Broadbeach’s Nathan Quick, Wilston Grange’s Steve Brittain, and Sandgate’s Tom Overington were the soul representatives in the team from their respective clubs. Palm Beach Currumbin had their fair share of winners on the night, with Chad Owens taking out QAFL Coach of the Year, and the Lions winning the Alpha Sport Club of the Year. The QAFL once again shared the spotlight with the Queensland Women’s Australian Football League (QWAFL) awards, highlighting some of Queensland’s top female footballers. In a dramatic vote count, Coolangatta-Tweed’s Leah Kaslar, and Yeronga’s Samantha Virgo couldn’t be split in the QWAFL Best and Fairest, sharing the award on 17 votes. After leading last year before going down with injury, Kaslar made amends, finishing the year strongly. While for Virgo, it caps off an incredible first year with Yeronga. Coolangatta Tweed’s Arianna Clarke was crowned the QWAFL Rising Star. Clarke has impressed at both club and state level this year. Jade Ransfield from Yeronga and Kalinda Howarth from Coolangatta-Tweed shared the QWAFL Goal Kicking Award, with 38 goals apiece, after Ransfield kicked 12 goals in the final round. Yeronga and Coolangatta Tweed had the most QWAFL Team of the Year representatives, with five each. UQ was the next best with four, while Zillmere and Wilston Grange had three, and Coorparoo two. Coorparoo’s Sally Young was awarded the QWAFL Club Volunteer of the Year, while Palm Beach Currumbin’s Anne Cornish was named the QAFL Club Volunteer of the Year. Phil Lillico and Ian Sealth were presented with the AFL Merit Award for their contribution to the game. Jack Gibson, Len Gregory, Josie Rogers, Mitch Hahn, Danny Wise, and the 1950 National Carnival held in Brisbane were all inducted into the AFL Queensland Hall of Fame, a special occurrence in the year we celebrate 150 years of football being played in Queensland.